WARNING: Graphic images. See Disclaimer at bottom of page regarding campaign creator. 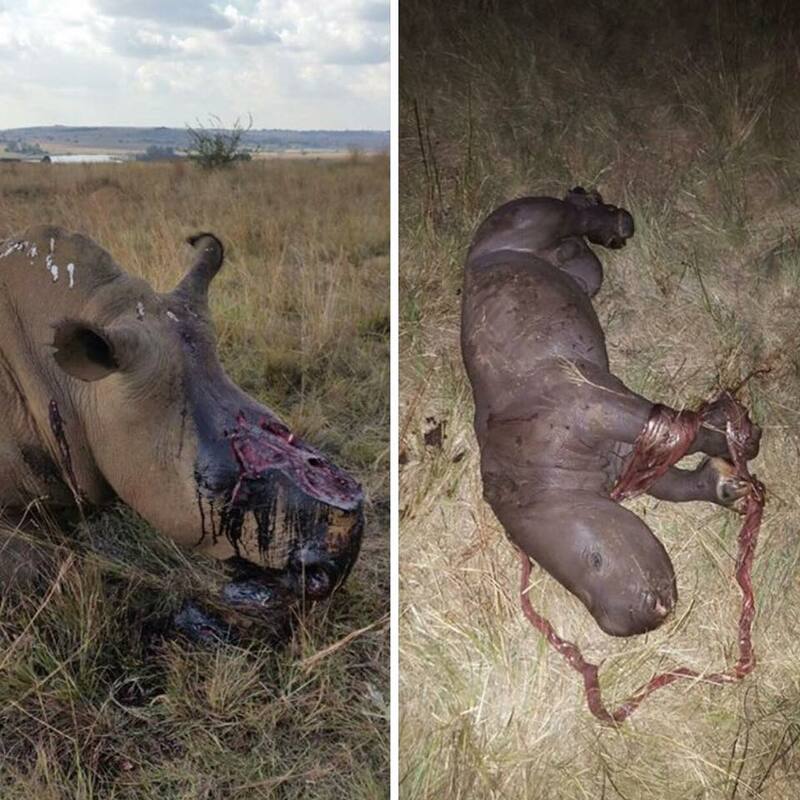 Under the cover of darkness, several gangs with suspected links to rhino poaching raided a rural village in Mozambique last week, attacking local wildlife anti-poaching team members. A number of anti-poaching scouts sustained critical injuries with one man abducted, tortured and finally dumped by a road side as part of a coordinated terror campaign. In the nearby Greater Lebombo Conservancy (GLC) conservation NGO the International Anti Poaching Foundation (IAPF) has been working in partnership with local stakeholder’s and the government of Mozambique. This partnership has been conducting a highly successful campaign against organised poaching syndicates. Homes were looted, with personal property and donated equipment destroyed in an organised attack against those supporting anti-poaching efforts in the region. The assailants specifically targeted anti-poaching unit assets and equipment - recently supplied bikes for patrols were destroyed and communications equipment (cell phones and two-way radios) stolen. In the wake of these attacks the IAPF has launched a global fundraising initiative to provide immediate medical and other relief to those affected. The campaign aims also to provide greater anti-poaching support to the affected areas in order to reduce the likelihood of further attacks. 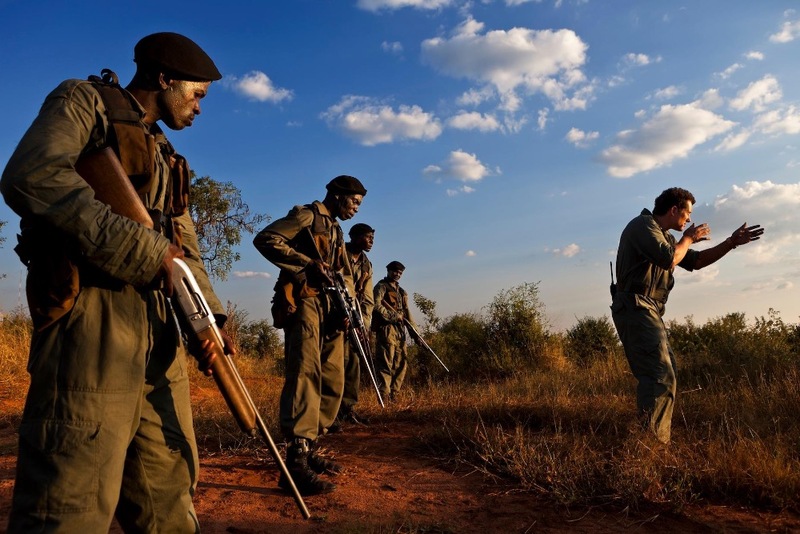 Speaking from the US, IAPF founder Damien Mander said: “These rangers are running a successful anti-poaching operation in southern Africa and are now being targeted in their homes, in front of their families. This is unacceptable. We need to demonstrate as a global community… we need to make a stand. We need to increase our efforts". The IAPF’s support to local anti-poaching efforts helps to safeguard up to 10,000 rhinos, meaning this growing non-profit is playing a critical role in the future of the species. Importantly, according to Mander, it also provides the opportunity to prevent the poachers themselves meeting a violent end whilst conducting their gruesome operations: nearly 400 have been killed in recent years, and as many sit in jail facing an uncertain future. “Better training for rangers, better equipment, better understanding of the local communities and what drives poaching - all these go towards saving both animal and human lives,” Mander said. 1. Approximately 25,000 rhino remain in Africa, with 20,000 in South Africa. 1,175 were killed in 2015 alone, which is up from just 13 in 2007. Kruger National Park accounts for approximately 70% of these deaths each year. 2. 2010-2014 there was an on average 55% increase in rhino carcasses each year in Kruger Park. In 2015, there was a .1% increase. In May 2016, it was announced that there is a 23% reduction in rhino poaching in Kruger through April 2016, 3.As Kruger Park accounts for most rhino deaths each year if poaching can be controlled there, the global rhino crisis can be stemmed. 4. 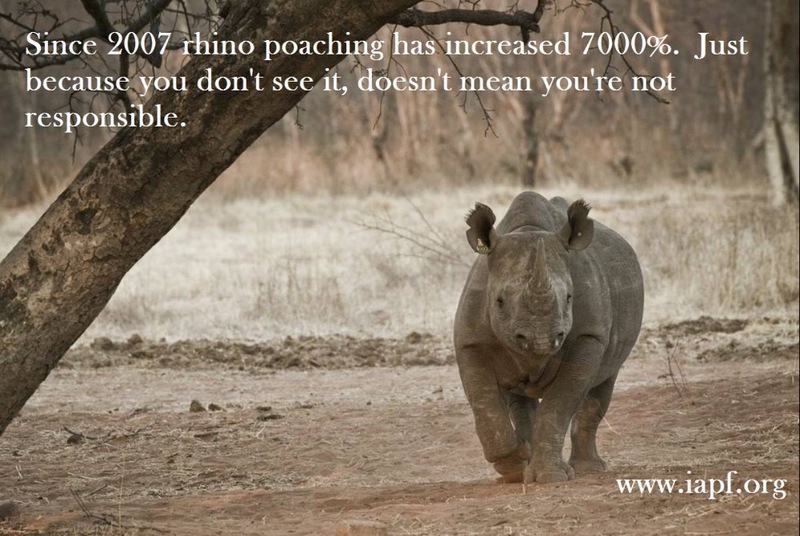 Rhino are being hunted to extinction for the price of the their horn in Asia. At $75k per kilogram, these majestic animals are the hardest to protect. A single horn can be worth 1 million dollars. 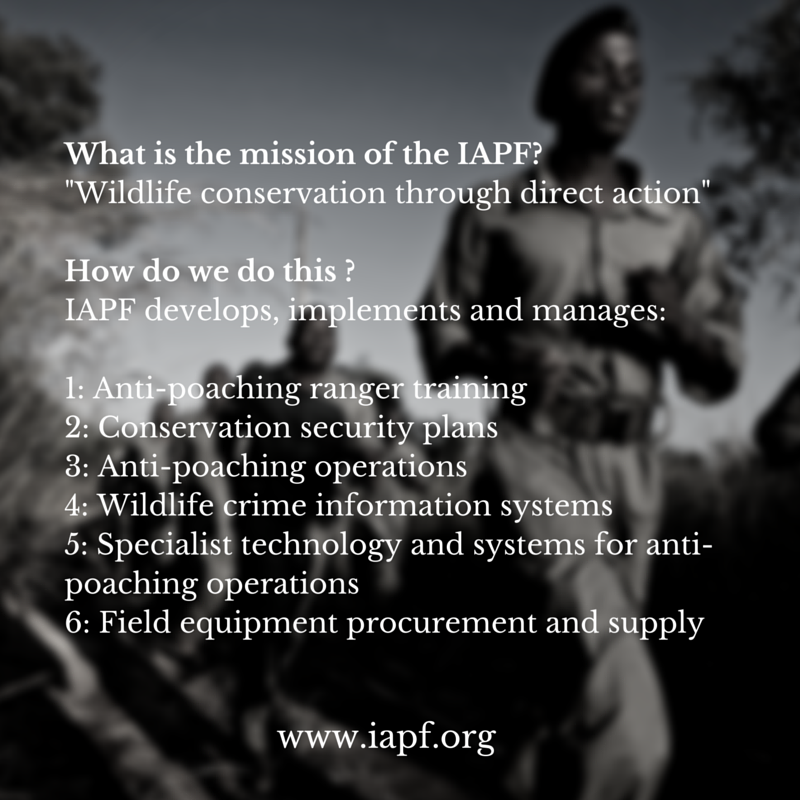 5.Partnering with governments and other stakeholders IAPF plays a critical role in buying time for this keystone species, and in protecting them, safeguarding entire ecosystems from poachers. 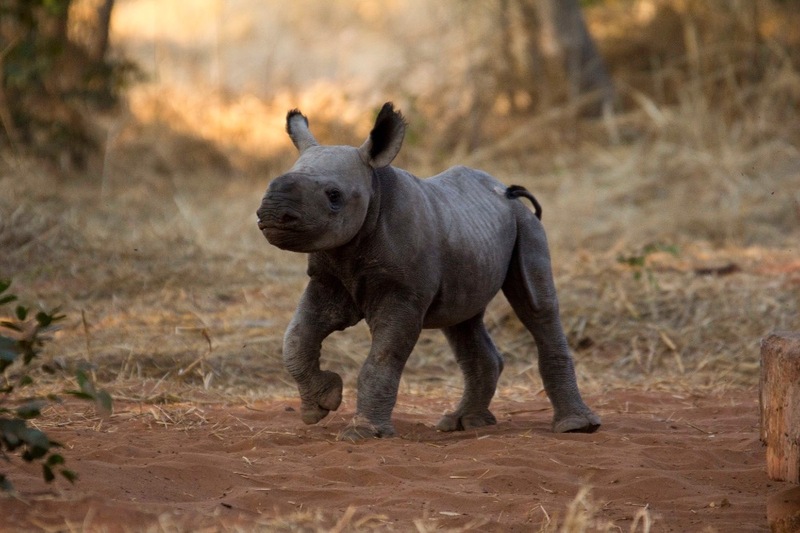 · For the first time since rhino were declared extinct in Mozambique in 2013, a resident population of approximately 25 rhinos has re-established itself in the country and Mozambique is expected to soon be officially re-classified as a rhino range state again. It is through the dedication and willingness of our anti-poaching rangers and the local authorities that risk their lives each day, that we are turning the tide in this Rhino War. In 2016, we are commencing anti-poaching operations at additional reserves around Southern Kruger National Park, and the world’s highest concentration of rhino. The goal is to eventually lock off access for poachers into Kruger and continue to expand safe habitat for rhino. As a result of our success in the GLC we have also been tasked by the Mozambique Government to assist them with training park rangers who are protecting the country’s National Parks. These wilderness areas hold the last bastions of Mozambique’s major elephant populations which are being decimated by poachers. 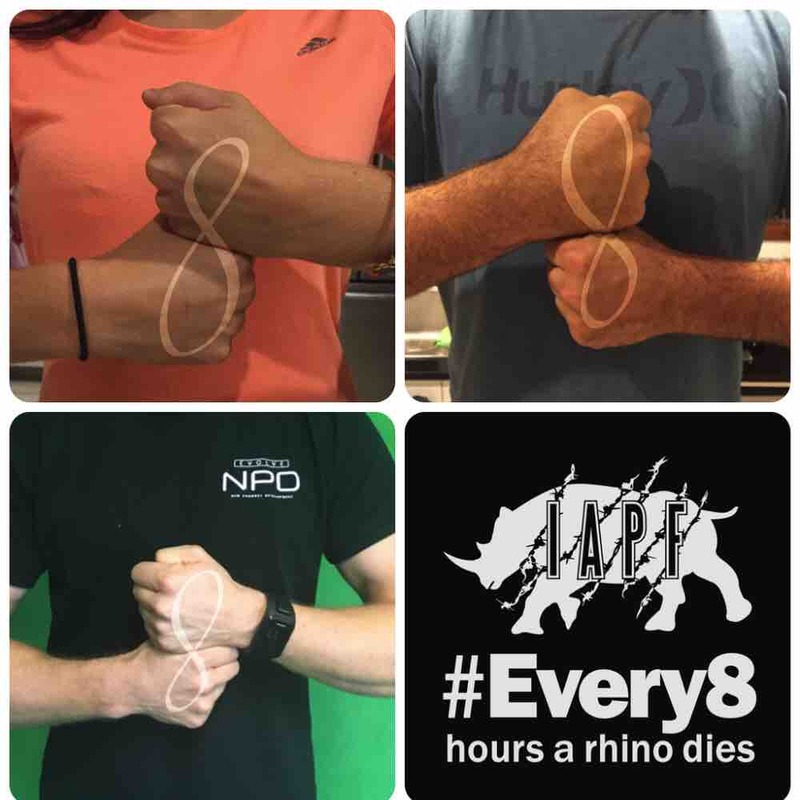 #Every8 hours a rhino dies. Take a photo of yourself doing this hand symbol with the hash tag #Every8 and share/tag/nominate your friends and family on social media to do the same. Help spread the word. 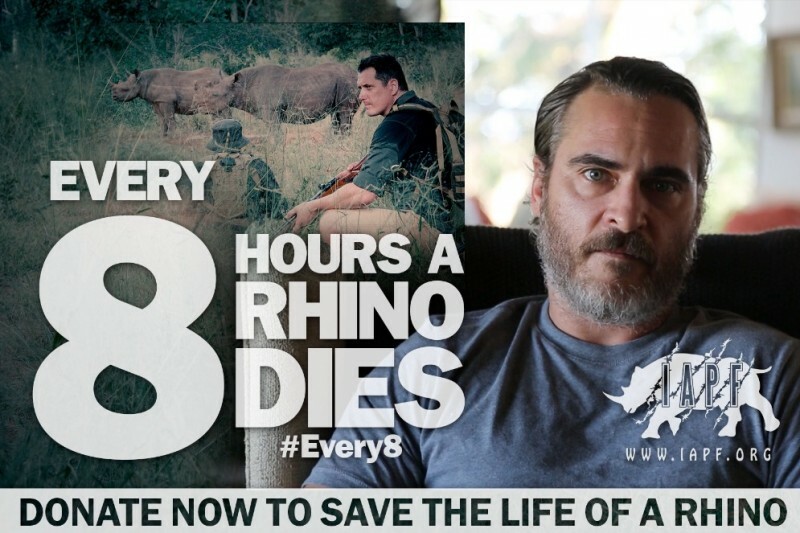 *Disclaimer: Paul Wilkie and Evolve Group have been engaged by the International Anti Poaching Foundation Limited to create this campaign on behalf of Damien Mander, Founder of IAPF. Bicycles are simple, reliable and a treasured possession for community scouts. 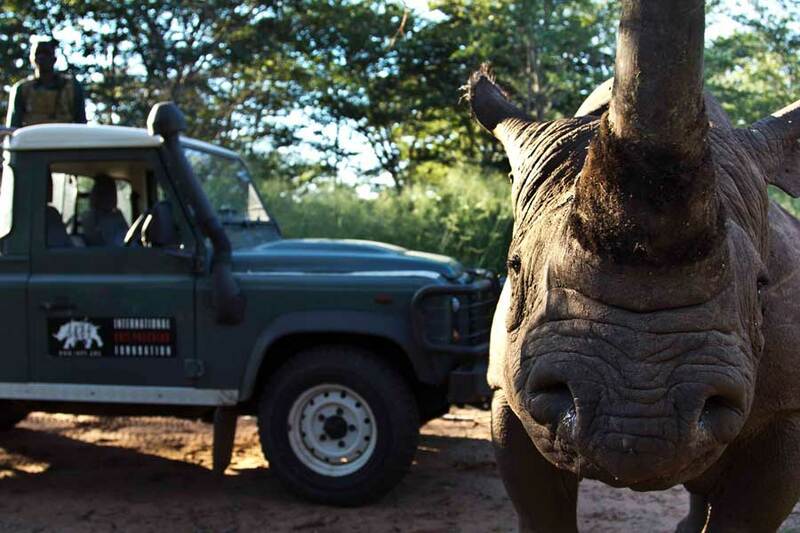 Help us replace what was destroyed and grow the fleet to allow greater involvement in anti-poaching by local communities. Access to medical facilities in the bush are extremely limited. Injured anti poaching personnel (and their families) are a top concern for us. Funds raised will be used for immediate treatment needs of injured personnel. Funds excess to immediate needs will be held for rehabilitation, future medical needs or used to grow the capacity of these local medical facilities. The exact level and value of property loss and damage is not yet clear. Funds in excess of immediate rebuilding and replacement needs will be used to enhance the security of rangers and these local communities. Uniforms, webbing, and basic field kit make an anti-poaching ranger functional in almost any conditions. This amount equips 10 rangers for one year. We can never have too many rangers. Rocky, uneven ground is hard on feet and hard on boots. There is a constant need to replace boots and provide new ones for additional rangers. While seemingly a small thing, comfortable, sturdy boots can transform a ranger. Effective digital radio communication is vital for coordination of ranger movements. IAPF has funded several radio repeater stations in the GLC and we now need to equip more vehicles and staff with radios. Additionally, we need GPS units, spot trackers and related equipment to try and stay one step ahead of the poachers. These highly trained dogs have proved invaluable in following poachers tracks and allowing rangers to make arrests. Canine Units allow us to track at over 15kms an hour versus 4kms by foot. The quicker we can close the gap between our rangers and poachers the greater the probability that we can catch poachers and stop rhinos from dying. This amount pays for one K9 tracking unit for one year, including handler, food and vet supplies. The more units we have, the more effective we can be. Rangers earn a miniscule wage in western employment terms but in their local communities, they can be some of the best paid employees. We run rigorous selection courses to ensure we recruit the very best we can. A steady job and a wage gives status to the role of wildlife ranger. The war against poaching needs all the rangers we can afford. Sturdy and reliable, well-equipped vehicles are critical to patrolling the harsh terrain of southern Africa. We urgently need at least two more Land Cruisers configured for anti-poaching support to ensure our rangers can reliably get in and out of dangerous areas. We lease a Robinson R44 helicopter by the month for fast response and deployment of rangers, K9 units, medical evacuation, aerial surveillance and wet weather access to remote areas. 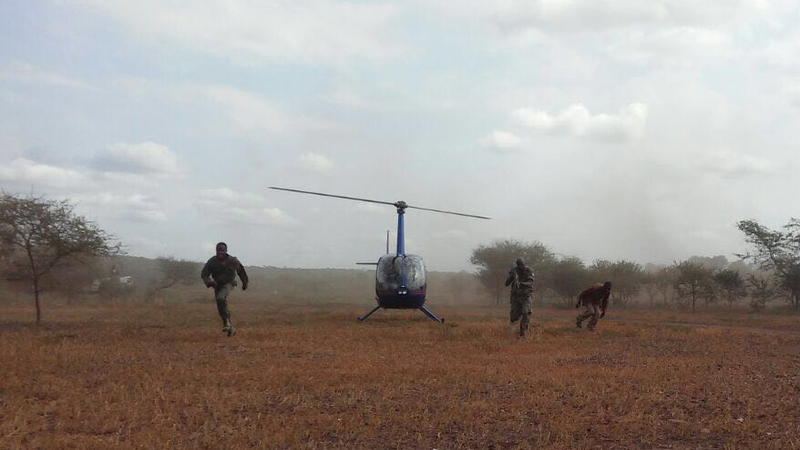 The presence of a helicopter is like a safety blanket for our rangers. This amount allows a full year of operations. How do I become a ranger? I am 48 years old and just retired after 30 years in the Police Force. I have extensive martial arts training, a comprehensive boxing career and won the shooting trophy in the Army against 92 other competitors during my 5 years in the army engineer reserve corps. I trained with the SAS in terrorist training and the Police Star force in helicopter training involving winch insurgency and extraction. I have extensive training with all weapons from pencil to Fully Automatic Rifles. I am completely self funded and need no financial support. I will stand between a gun and Rhino! How can we donate clothing? I work at a tactical business "First Tactical" and we have pants, boots, shirts. Please let me know! Everyone please share and ask your friends to donate and share the link to this page. These guys need millions to wipe out poaching. Let's get this thing viral.